As the high school students diligently send in their applications, the Youth Film Festival and the Four River Film Festival will be travelling the world. In the next month, headed by the festivals’ executive producer Marija Ratković and the program coordinator Sanja Zanki, the best films from last year will be screened at as much as four different film festivals in four different corners of Europe. Later this week the audience in Vinkovci will have a chance to see high school films during DORF, the festival of documentary rock film held 10-13 March. Only a week later, the YFF and FRFF will visit Budapest where from 18 to 20 March the Kid’s Eye Film Festival– international festival of kids and youth filmmaking is taking place, while the Irish town of Limerick is next on the tour schedule. 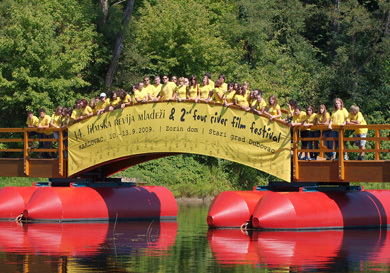 There, the festivals from Karlovac will be hosted by the Fresh Film Festival, a national and international festival of high school film held 28-31 March. The YFF and FRFF will conclude their European tour in Carate Brianza where the Timeline Film Festival is held from 4 to 9 April, also oriented at international high school filmmaking. The importance of this twofold event is evident not only from its support in Croatia, the region and the world but also from the continued success of its films and their authors in the context of professional film festivals. Therefore, the winner of the Best animated film award at last year’s YFF and FRFF, Book Man, from the School of arts in Split has been screened in competition at the recently held Festival of Croatian Animated Film, while The One Who Isn’t There from Dubrovnik Gymnasium and Blank Film Incubator, a film which won the award for Best documentary in Karlovac, was screened last week at the biggest festival of documentary film in the region – Zagreb Dox receiving a special recognition award from the festival’s young jury. This really proves that the YFF and FRFF are a starting point for young talents whose films are screen alongside those of established authors. A Grand Prix in Karlovac today, tomorrow perhaps an Oscar in L.A.!